Lonnie Potter led Palmdale High School to a playoff victory over rival Victor Valley in May 1989. The right-hander struck out three, walked one while giving up two earned runs, according to The San Bernardino County Sun. Potter went on from Palmdale High to the pros. His stint in the pros, however, turned out to be brief. He played parts of just two seasons. Potter's career began in 1990, signed by the Giants as an undrafted free agent. Potter is also credited as Lon Potter. With Bend, Potter finished out a June loss by eating up three innings and giving up a single hit. In July, he worked 3.1 innings and gave up six runs, five of them unearned. He gave up two runs in three innings of work in another July game. 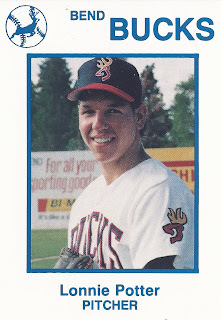 Overall in 1990, Potter got into 12 games in relief. He ended with an 8.39 ERA. The Giants then outright released him the next spring. Potter then returned to the field four years later for independent Antelope Valley. He got into three games, gave up three earned in 6.1 innings of work to end his career.